Ch-Ch-Ch-Changes are coming in the Windy City. Whether or not the Chicago Blackhawks continue to be successful remains to be seen — but so far, so good at 6-3-1 and tied for first in the Central Division — yet this team is quite different from what it used to look like last year, the year before that, and especially the prior years. Over the six years since this era of Blackhawks won their first Stanley Cup in 2010 up until their third in six seasons in 2015, we’ve watched them deal away — or let walk via free agency — many prominent players including: Andrew Ladd, Dustin Byfuglien, Brian Campbell, Antti Niemi, Patrick Sharp, Kris Versteeg, Troy Brouwer, Brandon Saad, Nick Leddy, Johnny Oduya, Brad Richards, Teuvo Teravainen and Andrew Shaw. Chicago general manager Stan Bowman has been phenomenal (for the most part) in his ability to retool and replenish his roster with savvy moves, like prying Artem Anisimov from Columbus in the Saad trade or signing KHL free agent Artemi Panarin aka the BreadMan – who has quickly become lethal alongside Patrick Kane; Panarin has 87 points in 90 career NHL games. This season’s find has been Richard Panik with his ten points through the first ten games, one more point than he had in 30 games with the Hawks last season. For every Panik and Panarin though, there has been a myriad of moves for players that haven’t worked out like Jimmy Hayes, Christian Ehrhoff, Jiri Sekac and Brandon Pirri. The West is ultra-competitive already this season and if the Blackhawks slump a bit too much, they could find themselves in a dogfight just to qualify for a playoff spot in one of the most competitive divisions in the league. One of the biggest questions that are challenging the club this season is can players like Tyler Motte, Ryan Hartman, Nick Schmaltz, Dennis Rasmussen, Gustav Forsling and Michal Kempny step up and take their game to the next level as a supporting cast for the big guns? 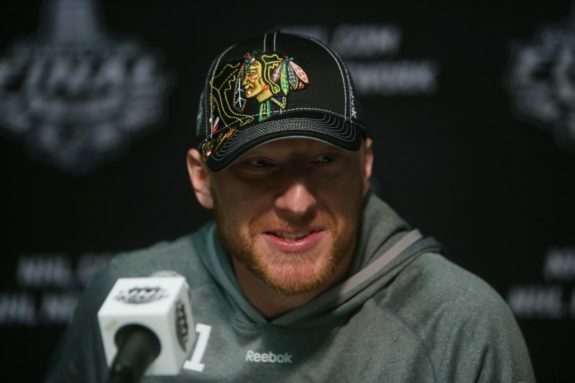 Hossa’s career has almost seemed like two lifetimes: one in which he played with Ottawa and Atlanta before being on the losing end of the Stanley Cup Final in back-to-back seasons, and the second in which he racked up three championship rings with the Hawks while (recently) surpassing 500 career goals and 1000 career points. “To tell you the truth in the summer I didn’t really think about it,” the Slovakian sniper responded when THW asked him about sitting on 499 goals when the season started. Though the style of the league has evolved throughout his lengthy career, he still has remained an effective player for the Hawks – especially in the postseason (73 points in 103 playoff games with Chicago).